Prove your arrogance and stupidity by wearing a shirt that shows which economic religion you follow. 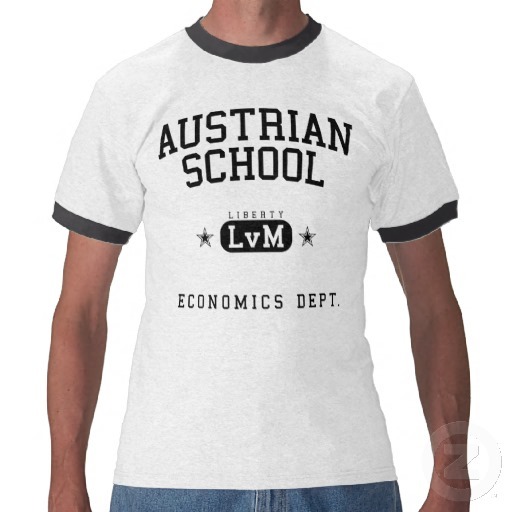 Those of you mired in the teaching world may or may not be familiar with the so-called “Austrian School” of economics. Turgidly, the “Austrian School” holds that markets are perfect and the government should stay out of them so that they can work their magic. There is tremendous, if not total, overlap between Austrian economics and libertarianism. Ron Paul is an adherent of the Austrian School, as he and his followers constantly like to remind us. You can get a quick introduction to the Austrian School by visiting its Wikipedia page which, apparently, has been locked in an internecine editing conflict. The conflict involves a criticism of the Austrian School by Paul Krugman which used to show up on the page. Certain libertarian acolytes have been taking down the Krugman part because they say it misrepresents Austrian economics. Others say that Krugman is a well-respected economist whose criticism should be included. Wikipedia has prevented the article from being edited for the rest of the month. For my part, I do not see why Krugman’s criticism cannot be left up there. If the Austrian folks think his argument is a straw man, then they can always include a rejoinder from another economist demonstrating how. This would assume rational dialogue and open debate is also part of the Austrian School. Unfortunately, Austrian economics has become a fundamentalism to many of its followers and they live in a constant state of jihad. There are Wikipedia pages about heroes of mine, like Friedrich Nietzsche and Michel Foucault (my avatar), that contain criticisms that I think are unfair. Never did I think of editing them out of existence. This is probably because Wikipedia is one very limited source of information. Those of us familiar with the ideas of these thinkers encountered them through the books they wrote. We have probably also read many books written by others that attempt to elaborate on these ideas and the criticisms they have faced. Therefore, when I read the Wikipedia pages of my intellectual heroes, I am already largely familiar with everything on the page. It is not a shock or an affront to read something negative about them. This seems to be the crux of the entire Austrian School Wikipedia fiasco. It is a philosophy nay, an ideology, that has gained many converts in this age of the internet. People like Ron Paul have become heroes in cyberspace. His stances on issues like imperialist war, the War on Drugs and government surveillance appeal to a young crowd naturally and rightfully mistrustful of the system. On top of that, a generation of half-digested internet documentaries and websites convey many libertarian ideas in easily consumable sound bites and slogans. Someone who is honestly looking for news from a non-mainstream source cannot help but encounter these things, especially since many of them are the first, second, third and fourth entries that come up on Google searches. Unfortunately, the whole anti-government tenor of the Austrian School is intellectually untenable. It posits that rules of the free market are immutably written on the face of nature, that a free market is the “natural” state of human society and that the existence of any imperfections in the market is the result of government interference. It is a system of beliefs that are not falsifiable. How does one “prove” that a “free market” is “natural”? This is such a loaded statement that it does not pass the giggle test. The Austrian folks take this as an article of faith, thereby betraying the spirit of economics as a social science. What sets science apart from most other fields is the fact that its conclusions are falsifiable through observation and analysis. The great economist Joe Stiglitz called such people “free market fundamentalists”. He was referring to economists but the label can be easily applied to the laymen who consider themselves adherents of the Austrian School. Its tone of anti-authoritarianism appeals to people who mistrust the system. It just so happens that the internet attracts these types of people. For my part, I have had many discussions with libertarians both at Occupy and in my salad days as an internet troll. When I ask what they would do with things like education, police, transportation, energy and other big government programs, their answer is always a simplistic “hands off” ideology for the government. For them, the role of government should be to merely hang back and enforce private contracts. When I would then ask them what happens if a monopoly starts to develop which is anathema to the free market, the answer either is “it won’t happen” or “there should be laws in place to prevent such things”. The first response is hokum with no basis in reality or history, another belief that is not falsifiable. The second response starts a slippery slope where every free market eventuality can be corrected with laws. In that case, free markets need the very same government that Austrian types blame as the cause for all of the free market’s ills. What I have found is that people who believe this type of stuff fall into one of two categories. They can be wealthy people who have embraced an extreme “small government” idea that amounts to a bunch of self-serving nonsense. Or, more frequently, they are people with a simplistic, individualistic view of society who believe that everyone has full control of their destiny at all times. It is the “pull yourself up by your bootstraps” crowd. They are the people who watch a video of starving children in Africa and ask “why don’t they just move to where the food is?” or “serves them right for being lazy”. They are the people who think that the fact they can go camping in the woods for a weekend means they are “self-sufficient”, the meaning of that term apparently being totally lost on them. They are the people who believe that over 100 million unemployed Americans are just being lazy. They are the Ayn Rand fans and other assorted lickspittles of the wealthy. It is no surprise that the page on Austrian economics is being purged of every criticism by its acolytes. To them, the internet is everything. Anything that is worth knowing about the world comes from cheesy documentaries and simplistic slogans delivered in pixels. The one idea that they have latched onto must be the correct idea, despite the fact they have not bothered to expose themselves to any other ideas. They are allergic to books, especially works of history since they tend to have a “liberal bias” or are a product of the filthy system. It is like the child who learns something at school and cannot wait to share it with everyone they know, assuming that they are the only ones privy to this awesome knowledge. Despite what the Austrian folks think, they are not the guardians of knowledge and truth. Another person’s rejection of their beliefs does not automatically make that person an idiot. The world contains a vast array of ideas and perspectives. Knowing one theory about one discipline does not make you an expert on anything. A Wikipedia page is not an indoctrination tool where every word has to follow the party line. It is supposed to contain a range of ideas associated with a subject, including criticism of that subject. This might not comport with the dogmatic, fundamentalist world in which they live but, after all, we do still live in the United States. Although if the free market fundamentalists, Neoliberals and austerity hawks keep having their way, then I might not be living here for much longer.